Like many Turkey watchers, Erik Meyersson and Dani Rodrik argue in the latest Foreign Affairs that Turkey is no longer a democracy. In contrast to many Turkey watchers, they argue that this slide began early in the now-eleven-year rule of Recep Tayyip Erdogan and his Justice and Development Party (AKP) and has continued apace ever since. Turkey’s institutional deterioration is not a recent matter. It started long before Erdogan’s manifestly heavy-handed and polarizing responses to the Gezi protests of the summer of 2013 and to the corruption probe in winter 2013. The harsh crackdown on the media over the last year is but the latest phase in an ongoing process of repression of independent press. And Erdogan and the Gülenists have long manipulated the judiciary, using it to harass and jail opponents on charges ranging from the flimsy to the fabricated. If this is correct—and I believe it is—then Turkey has essentially regressed toward the mean. Most attempts at democracy fail, and in the past 20 years, most of those failures have come in the form of consolidations of incumbent advantage. An authoritarian regime breaks down; competitive elections are held; a party wins those elections; and, finally, that party uses its incumbency to retool the machinery of the state in ways that ensure it stays in power. Consolidations of incumbent advantage are common, in part, because most political organizations covet power, especially once they attain it. Even when those organizations don’t covet power, though, uncertainty about the willingness of their political rivals and the military to abide by democratic rules gives ruling parties added incentive to tighten their grip on government as a way to avoid their worst-case scenarios involving the re-establishment of authoritarian rule under someone else. In my book on dilemmas of democratic consolidation, written about five years ago, I used Turkey under the AKP as a example of how, counterintuitively, these pressures could sometimes counterbalance each other and actually help democracy persist. In the Turkish case, it was the military’s traditional role as the guarantor of secular republicanism and final arbiter of political disputes that seemed to be checking democracy’s normal tendencies toward consolidation of incumbent advantage. The threat of a military coup was in a kind of sweet spot: it was still real enough to deter the AKP from trying nakedly to impose authoritarian rule, but it was no longer so strong that AKP would feel compelled to act aggressively in order to protect against its least-preferred outcome. Apparently, that’s changed. Over the past decade, the risk of a military coup has declined enough that AKP no longer regards it as a credible threat. Of course, AKP helped bring about this shift, and thus the consolidation of its own power, with its dogged prosecution of the the alleged Ergenekon coup plot. As Erik Meyersson pointed out in an email to me, AKP’s sheer electoral power surely helped to deter military intervention as well. Had the military usurped power from Erdogan and his colleagues, the ensuing social and economic upheaval would likely have rendered the coup a poisoned chalice. Ironically, Turkey’s membership in NATO may have played a role, too, by helping to socialize Turkish officers against direct intervention in politics. Whatever the precise and ultimately unknowable causes of this regression are, the status that still seemed fuzzy to me a year ago is now clear. Turkey has joined the ranks of the world’s electoral authoritarian regimes, full stop. In so doing, it has followed the modal path of attempts at democracy in the post–Cold War period, giving us another reminder that “normal” isn’t necessarily better. Thailand just had another coup, its first since 2006 but its twelfth since 1932. Here are a few things statistical analysis tells us about how that coup is likely to reverberate through Thailand’s economy and politics for the next few years. 1. Economic growth will probably suffer a bit more. Thailand’s economy was already struggling in 2014, thanks in part to the political instability to which the military leadership was reacting. Still, a statistical analysis I did a few years ago indicates that the coup itself will probably impose yet more drag on the economy. When we compare annual GDP growth rates from countries that suffered coups to similarly susceptible ones that didn’t, we see an average difference of about 2 percentage points in the year of the coup and another 1 percentage point the year after. (See this FiveThirtyEight post for a nice plot and discussion of those results.) Thailand might find its way to the “good” side of the distribution underlying those averages, but the central tendency suggests an additional knock on the country’s economy. 2. The risk of yet another coup will remain elevated for several years. The “coup trap” is real. Countries that have recently suffered successful or failed coup attempts are more likely to get hit again than ones that haven’t. This increase in risk seems to persist for several years, so Thailand will probably stick toward the top of the global watch list for these events until at least 2019. 3. Thailand’s risk of state-led mass killing has nearly tripled…but remains modest. The risk and occurrence of coups and the character of a country’s national political regime feature prominently in the multimodel ensemble we’re using in our atrocities early-warning project to assess risks of onsets of state-led mass killing. When I recently updated those assessments using data from year-end 2013—coming soon to a blog near you!—Thailand remained toward the bottom of the global distribution: 100th of 162 countries, with a predicted probability of just 0.3%. If I alter the inputs to that ensemble to capture the occurrence of this week’s coup and its effect on Thailand’s regime type, the predicted probability jumps to about 0.8%. That’s a big change in relative risk, but it’s not enough of a change in absolute risk to push the country into the end of the global distribution where the vast majority of these events occur. In the latest assessments, a risk of 0.8% would have placed Thailand about 50th in the world, still essentially indistinguishable from the many other countries in that long, thin tail. Even with changes in these important risk factors and an ongoing insurgency in its southern provinces, Thailand remains in the vast bloc of countries where state-led mass killing is extremely unlikely, thanks (statistically speaking) to its relative wealth, the strength of its connection to the global economy, and the absence of certain markers of atrocities-prone regimes. 4. Democracy will probably be restored within the next few years… As Henk Goemans and Nikolay Marinov show in a paper published last year in the British Journal of Political Science, since the end of the Cold War, most coups have been followed within a few years by competitive elections. The pattern they observe is even stronger in countries that have at least seven years of democratic experience and have held at least two elections, as Thailand does and has. In a paper forthcoming in Foreign Policy Analysis that uses a different measure of coups, Jonathan Powell and Clayton Thyne see that same broad pattern. After the 2006 coup, it took Thailand a little over a year to get back to a competitive elections for a civilian government under a new constitution. If anything, I would expect this junta to move a little faster, and I would be very surprised if the same junta was still ruling in 2016. 5. …but it could wind up right back here again after that. As implied by nos. 1 and 2 above, however, the resumption of democracy wouldn’t mean that Thailand won’t repeat the cycle again. Both statistical and game-theoretic models indicate that prospects for yet another democratic breakdown will stay relatively high as long as Thai politics remains sharply polarized. My knowledge of Thailand is shallow, but the people I read or follow who know the country much better skew pessimistic on the prospects for this polarization ending soon. From afar, I wonder if it’s ultimately a matter of generational change and suspect that Thailand will finally switch to a stable and less contentious equilibrium when today’s conservative leaders start retiring from their jobs in the military and bureaucracy age out of street politics. Justin Heifetz at the Bangkok Post asked me this morning for some comments on the current political situation in Thailand. Here is a slightly modified version of what I wrote in response to his questions. I won’t speak to the specifics of Thai culture or social psychological theories of political behavior, because those things are outside my areas of expertise. What I can talk about are the strategic dilemmas that make some countries more susceptible to coups and other breakdowns of democracy than others. Instead of thinking in terms of a “coup culture”, I think it’s useful to ask why the military in the past and opposition parties now might prefer an unelected government to an elected one. In the case of Thailand, it’s clear that some opposition factions recognize that they cannot win power through fair elections, and those factions are very unhappy with the policies enacted by the party that can. There are two paths out of that conundrum: either seize power directly through rebellion, or find a way to provoke or facilitate a seizure of power by another faction more sympathetic to your interests—in this and many other cases, the military. Rebellions are very hard to pull off, especially for minority factions, so that often leaves them with trying to provoke a coup as their only viable option. Apparently, Suthep Thaugsuban and his supporters recognize this logic and are now pursuing just such a strategy. The big question now is whether or not the military leadership will respond as desired. They would be very likely to do so if they coveted power for themselves, but I think it’s pretty clear from their actions that many of them don’t. I suspect that’s partly because they saw after 2006 that seizing power didn’t really fix anything and carried all kinds of additional economic and reputational costs. If that’s right, then the military will only seize power again if the situation degenerates enough to make the costs of inaction even worse—say, into sustained fighting between rival factions, like we see in Bangladesh right now. So far, Pheu Thai and its supporters seem to understand this risk and have mostly avoided direct confrontation in the streets. According to Reuters this morning, though, some “red shirt” activists are now threatening to mobilize anew if Suthep & co. do not back down soon. A peaceful demonstration of their numbers would remind the military and other fence-sitters of the electoral and physical power they hold, but it could also devolve into the kind of open conflict that might tempt the military to reassert itself as the guarantor of national order. Back on 1 December, red shirts cut short a rally in a Bangkok stadium after aggressive actions by their anti-government rivals led to two deaths and dozens of injuries, and there is some risk that fresh demonstrations could produce a similar situation. On how or why this situation has escalated so quickly, I’d say that it didn’t really. This is just the latest flare-up of an underlying process of deep socio-economic and political transformation in Thailand that accelerated in the early 2000s and probably isn’t going to reach a new equilibrium of sorts for at least a few more years. Earlier in this process, the military clearly sided with conservative factions struggling to beat back the political consequences of this transformation for reasons that close observers of Thai politics surely understand much better than I. We’ll see soon if they’ve finally given up on that quixotic project. Whatever happens this time around, though, the good news is that within a decade or so, Thai politics will probably stabilize into a new normal in which the military no longer acts directly in politics and parts of what’s now Pheu Thai and its coalition compete against each other and the remnants of today’s conservative forces for power through the ballot box. Since 25 October they have held general strikes and road-rail blockades, leading to widespread violence and hitting the economy hard. Dozens of vehicles have been burned or damaged by blockade supporters on the only highway linking the port city of Chittagong with the capital Dhaka. The all-important garments industry, which accounts for nearly 80% of Bangladesh’s exports, has been unable to make shipments for a week. ”If the current crisis continues for another month, then the whole economy will stumble to a halt and it will be very difficult to recover from it,” said Rubana Huq, managing director of the Mohammadi Group, a major garments exporting firm. The histories of Europe and Latin America imply that Bangladesh will eventually find a way out of these oscillations onto a new equilibrium that includes durable democracy. Unfortunately, the history of countries born in the past half-century—never mind a cursory look at the politics on the streets of Dhaka right now—suggests this election cycle probably isn’t the moment that’s going to happen. Things could still turn for the better, and this crisis could lead to a resolution that puts democracy in Bangladesh on firmer footing. That said, the latest news from BBC does not make me optimistic. In fact, my statistical assessments of coup risk for 2013 lead me to believe that the prospects of another extra-constitutional seizure of power in Bangladesh in the near future are no longer small. That’s what happened when things last reached this kind of fever pitch in 2007, and Bangladesh’s presence among the 20 most coup-susceptible countries in the world this year suggests there’s a sizable chance we’ll see a similar turn of events again before election day on 5 January. If I treat the annual statistical forecast as my prior and use Bayes’ rule and some back-of-the-envelope estimates about the relationship between unrest this intense and coup risk to update it, I assess the probability of a coup attempt in Bangladesh in the run-up to elections at about 30 percent. That may not sound like much, but it’s a lot higher than the estimate of about 10 percent I get when I do a similar exercise for Thailand right now, where a somewhat similar process is unfolding. In other words, if I had to pick between Bangladesh or Thailand as the country more likely to see a coup attempt in the next several weeks, I would bet on Bangladesh. Can Venezuela’s Maduro Survive Hyperinflation? The economic crisis of which this inflationary spiral is just one part has lots of people wondering how long Venezuela’s president, Nicolás Maduro, can hang on to power. Historical evidence on what happens to political leaders during periods of hyperinflation could give us a good starting point for hazarding a prediction on that matter. Best I can tell, though, this isn’t something that’s been studied before, so I decided to scrounge up some some data and take a look. I started with a table Hanke and Nicolas Krus published in 2012 that identifies all episodes of hyperinflation around the world since the late eighteenth century (here). By their definition, a hyperinflationary episode starts when there is a month in which prices increase by at least 50%, and it ends when the inflation rate drops below that threshold and then stays under it for at least a year. Their table identifies when each episode began and ended and the peak and average daily inflation rates involved. The good news is that this data set exists. The bad news is that it is only posted in PDF form, so I had to type it into a spreadsheet to start working with it. According to Hanke and Krus’ table, there have been more than 50 spells of hyperinflation around the world in the past couple of centuries. As the plot below shows, virtually all of those occurred the past 100 years in three clusters: one in the 1920s, another in the 1940s, and the last and by far the largest in the 1990s following the disintegration of the USSR and Yugoslavia. The duration of those episodes has varied widely, from a few months or less (many cases) to more than five years (Nicaragua from 1986 until 1991). 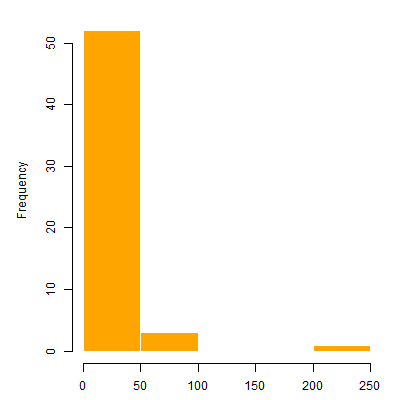 As you can see in the histogram below, the distribution of durations seems to be bimodal. Most episodes end quickly, but the ones that don’t usually go on to last at least two or three years. The average daily rate of inflation in those episodes has varied much less. 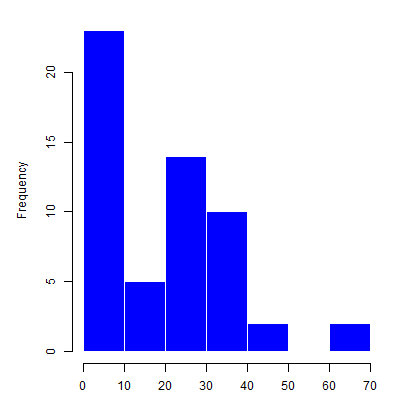 As the next histogram shows, nearly all of the episodes have involved average daily rates in the low single digits. Cases like Zimbabwe in 2007-2008, when the daily inflation rate averaged nearly 100% (! ), are quite rare. To analyze the fate of political leaders during these episodes, I used the Archigos data set to create a variable indicating whether or not a country’s chief executive was replaced during or soon after the episode of hyperinflation. Suspecting that those fates would depend, in part, on the nature of a country’s national political regime, I also used a data set I created in a past professional life to add a variable marking whether or not a country’s political regime was democratic when the episode started. A quick look at a contingency table confirmed my hunches that political leaders often lose their jobs during periods of hyperinflation, but also that the pattern differs across democracies and autocracies. Of the 49 episodes that occurred in cases for which I also had data on leaders’ fates and regime type, leadership changes occurred during or soon after 18 of them (37 percent). Eleven of those changes occurred in the 23 cases that were democracies at the time (48 percent). The other seven leader changes came from the 26 episodes that occurred under authoritarian regimes (27 percent). Based on those data alone, it looks like chief executives in democracies are about as likely to lose their jobs during a hyperinflationary episode as they are to hang on to them, while autocrats face more favorable odds of political survival of roughly 3:1. Of course, the episodes of hyperinflation aren’t identical. As we saw above, some last a lot longer than others, and some involve much steeper inflation rates. To get a sense of how those things affect the fate of the leaders who preside over these dismal spells, I used the ‘glm‘ command in R to estimate a logistic regression model with my binary leadership-change indicator as the outcome and democracy, episode duration, and average daily inflation rate as the covariates. Guessing that the effects of the latter two covariates might be mediated by regime type, I also included interaction terms representing the products of my democracy indicator and those other two variables. The model is admittedly crude,* but I think the results are still interesting. According to my estimates, the severity of the episode isn’t systematically associated with variation in the fate of national leaders in either type of political regime. For both democracies and autocracies, the substantive effects of the average daily rate over the course of the hyperinflationary episode were roughly zero. By contrast, the duration of the episode does seem to matter, but only in autocracies. Democratically elected leaders are relatively vulnerable no matter how long the episode lasts. For their part, autocrats aren’t very likely to get knocked out of office during short episodes, but in episodes that persist for a few years, they are about as likely to get tossed as their democratic counterparts. The plot below shows just how bad it gets for autocrats in long-lasting hyperinflationary episodes, assuming average severity. Part of that’s just the additional exposure—the longer the episode, the more likely we are to see a leader exit office for any reason—but the estimated probabilities we see here are much higher than the base rate of leadership change in authoritarian regimes, so it looks like the extended spell of hyperinflation is probably doing some of the work. So what does all this tell us about Maduro’s prospects for political survival, assuming that Venezuela is sliding into a period of hyperinflation? I consider Venezuela’s political regime to be authoritarian, so f I only had these statistics to go by, I would say that Maduro will probably survive the episode, but the chances that he’ll get run out of office will increase the longer the hyperinflation lasts. I’m not an economist, so my best guess at how long Venezuela might suffer under hyperinflation is the average duration from Hanke’s list. That’s a little shy of two years, which would give Maduro odds of about 4:1 to of weathering that storm. Of course, those statistics aren’t all the information we’ve got. Other things being equal, authoritarian regimes with leaders in their first five years in office—like Venezuela right now—are about three times as likely to transition to democracy as ones with guys who’ve been around for longer, and democratic transitions almost always entail a change at the top. We also know that Maduro so far has been a “boring and muddled” politician, and that there are some doubts about the loyalty he can expect from the military and from other Chavista elites. Putting all of those things together, I’d say that Maduro’s presidency probably won’t last the six years he won in the April 2013 election. Who or what might come next is a whole other question, but as a new leader presiding over an inflationary spiral with weak skills and a shaky coalition, Maduro would seem to have the deck stacked against him. Data and code for the plots and modeling can be found here and here, respectively. 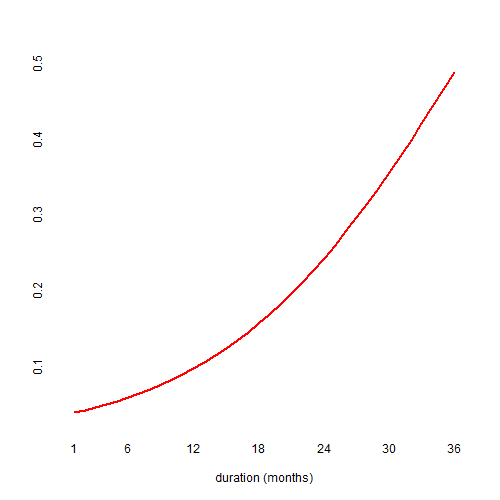 * To really do this right, I would want to plot survival curves that treat the time from the onset of the hyperinflationary episode to the leader’s exit as the outcome of interest, with right censoring at the episode’s end and regime type as an initial condition. As they say in academese, though, the data preparation that more careful analysis would require was beyond the scope of this blog post. I mean, I’m not Brett Keller. If you want to get a feel for the political muddles that trap most countries for decades on a sine wave of democratization and de-democratization, and why durable exits from those oscillations are so hard to come by, you might want to take a look at Bangladesh. Bangladesh won its independence from Pakistan in 1971 after a genocidal struggle that left hundreds of thousands dead and displaced tens of millions. Since then, the country has roughly split its time between democratic and authoritarian rule. As happened in many newly independent states in the twentieth century, the champions of national independence came to power through elections and then refused to leave. Also typically, the one-party regime born of that refusal soon fell to a restive military. Seventeen years passed before another fairly-elected civilian government came to power, starting the longest spell of more or less democratic government in the country’s still-short history. On 19 January [2012, the military] announced it had foiled a coup by mid-level and retired officers who sought to install an Islamist government. This followed an assassination attempt on an AL member of parliament in October 2009 by mid-level officers seething over the deaths of 57 officers in a mutiny by their subordinate paramilitary border guards the previous February. Large-scale dismissals, forced retirements, deepening politicisation and a heavy-handed approach to curb dissent and root out militants have created an unstable and undisciplined force. The systemic result of this struggle between two political rivals and the military is the familiar “truel,” or Mexican standoff, that characterizes politics in many countries stuck between stable dictatorship and durable democracy. The defining feature of this standoff is each player’s uncertainty about its rivals’ intentions; no one trusts that the others won’t make a grab for power and then shut out or destroy the others. That uncertainty, in turn, sharply increases the odds of undemocratic behavior, because even players fully committed to democracy in principle might feel pressed to cement or usurp power in order to block their distrusted rivals from doing the same to them first. Now, in late 2013, elections are due again, and Bangladesh seems to be spiraling toward another local climax of this cyclical confrontation. As Reuters reports, the AL and BNP have called competing rallies in the capital this Friday, and at least one party leader has told followers to come “prepared with arms.” Already this year, state security forces have killed scores of protesters in unrest spawned by the workings of a war-crimes tribunal that many BNP sympathizers see as a political bludgeon directed against them. According to my statistical forecasts, Bangladesh ranks among the 20 countries in the world most susceptible to coup attempts this year, a result that confirms many observers’ concerns that the military might respond to wider disorder as it did in 2007. So how does a country get off of this roller coaster? Attempts to induce democratic consolidation often focus on institutional design, but Bangladesh shows how this prescription is more easily written than filled. One of the focal points in the current confrontation is the AL government’s recent decision to dispense with an arrangement whereby a caretaker body would replace the elected government in the run-up to elections. The BNP has cast that decision as an attempt by the ruling AL to tilt the upcoming election in its own favor. Ironically, though, the caretaker arrangement has often been the focal point of mutual recriminations in past elections, as the two parties would fight over whether or not the caretakers were sufficiently unbiased. In other words, the system that was meant to dampen that mutual distrust only seemed to end up stoking it, but when one party finally made a change, that act is seen through the same lens. The fundamental problem with expecting rule changes to induce democratic consolidation is that the process of institutional design and change is itself political, so it is subject to the same pathologies and touches off the same worries. Outsiders can also exhort party leaders to negotiate in good faith, but parties aren’t unitary actors. Those leaders sit atop a massive pyramid of principal-agent problems, and internal rivals often respond opportunistically to attempts at compromise by stoking fears of capitulation and offering themselves as the bulwark against it. Aware of this risk, those leaders rarely take the first step. I’ve read two pieces in the past two days that have tried to draw lessons from one or more cases about how policy-makers and practitioners can improve the odds that ongoing or future democratic transitions will succeed by following certain rules or formulas. They’ve got my hackles up, so figured I’d use the blog to think through why. The first of the two pieces was a post by Daniel Brumberg on Foreign Policy‘s Middle East Channel blog entitled “Will Egypt’s Agony Save the Arab Spring?” In that post, Brumberg looks to Egypt’s failure and “the ups and downs of political change in the wider Arab world” to derive six “lessons or rules” for leaders in other transitional cases. I won’t recapitulate Brumberg’s lessons here, but what caught my eye was the frequent use of prescriptive language, like “must be” and “should,” and the related emphasis on the “will and capacity of rival opposition leaders” as the crucial explanatory variable. The second piece came in this morning’s New York Times, which included an op-ed by Jonathan Tepperman, managing editor of Foreign Affairs, entitled “Can Egypt Learn from Thailand?” As Tepperman notes, Thailand has a long history of military coups, and politics has been sharply polarized there for years, but it’s still managed to make it through a rough patch that began in the mid-2000s with just the one coup in 2006 and no civil war between rival national factions. How? The formula turns out to be deceptively simple: provide decent, clean governance, compromise with your enemies and focus on the economy. This approach is common in the field of comparative democratization, and I’ve even done a bit of it myself. I think scholars who want to make their work on democratization useful to policy-makers and other practitioners often feel compelled to go beyond description and explanation into prescription, and these lists of “best practices” are a familiar and accessible form in which to deliver this kind of advice. In the business world, the archetype is the white paper based on case studies of a one or a few successful firms or entrepreneurs: look what Google or Facebook or Chipotle did and do it, too. In comparative democratization, we often get studies that find things that happened in successful cases but not in failed ones (or vice versa) and then advise practitioners to manufacture the good ones (e.g., pacts, fast economic growth) and avoid the bad (e.g., corruption, repression). Narrative fallacies arise inevitably from our continuous attempt to make sense of the world. The explanatory stories that people find compelling are simple; are concrete rather than abstract; assign a larger role to talent, stupidity, and intentions than to luck; and focus on a few striking events that happened rather than on the countless events that failed to happen. We are prone to blame decision makers for good decisions that worked out badly and to give them too little credit for successful moves that appear obvious only after the fact… Actions that seem prudent in foresight can look irresponsibly negligent in hindsight [and vice versa]. When I read Tupperman’s “deceptively simple” formula for the survival of democracy and absence of civil war in Thailand, I wondered how confident he was seven or five or two years ago that Yingluck Shinawatra was doing the right things, and that they weren’t going to blow up in her and everyone else’s faces. I also wonder how realistic he thinks it would have been for Morsi and co. to have “provide[d] decent, clean governance” and “focus[ed] on the economy” in ways that would have worked and wouldn’t have sparked backlashes or fresh problems of their own. Brumberg’s essay gets a little more distance from outcome bias than Tepperman’s does, but I think it still greatly overstates the power of agency and isn’t sufficiently sympathetic to the complexity of the politics within and between relevant organizations in transitional periods. In Egypt, for example, it’s tempting to pin all the blame for the exclusion of political rivals from President Morsi’s cabinet, the failure to overhaul the country’s police and security forces, and the broader failure “to forge a common vision of political community” (Brumberg’s words) on the personal shortcomings of Morsi and Egypt’s civilian political leaders, but we have to wonder: given the context, who would have chosen differently, and how likely is it that those choices would have produced very different outcomes? Egypt’s economy is suffering from serious structural problems that will probably take many years to untangle, and anyone who thinks he or she knows how to quickly fix those problems is either delusional or works at the IMF. Presidents almost never include opposition leaders in their cabinets; would doing so in Egypt really have catalyzed consensus, or would it just have led to a wave of frustrated resignations a few months down the road? Attempting to overhaul state security forces might have helped avert a coup and prevent the mass killing we’re seeing now, but it might also have provoked a backlash that would have lured the military back out of the barracks even sooner. And in how many countries in the world do political rivals have a “common vision of political community”? We sure don’t in the United States, and I’m hard pressed to think of how any set of politicians here could manufacture one. So why should I expect politicians in Egypt or Tunisia or Libya to be able to pull this off? Instead of advice, I’ll close with an observation: many of the supposed failures of leadership we often see in cases where coups or rebellions led new democracies back to authoritarian rule or even state collapse are, in fact, inherent to the politics of democratic transitions. The profound economic problems that often help create openings for democratization don’t disappear just because elected officials start trying harder. The distrust between political factions that haven’t yet been given any reason to believe their rivals won’t usurp power at the first chance they get isn’t something that good intentions can easily overcome. As much as I might want to glean a set of “best practices” from the many cases I’ve studied, the single generalization I feel most comfortable making is that the forces which finally tip some cases toward democratic consolidation remain a mystery, and until we understand them better, we can’t pretend to know how to control them. What began as a humble attempt to translate countrywide discontent with the way President Mohamed Morsi has governed Egypt, the Tamarod — or “Rebel” campaign — has mobilized millions of Egyptians for a protest that promises to be epic on the anniversary of Morsi’s inauguration. Although opposition forces initially kept the signature drive that demands Morsi’s removal from office and early elections at arms length, nearly all of the relevant players in Egypt’s transitional drama now recognize the campaign’s significance and potential to affect change. Movement within the political opposition, including coordination meetings with the campaign and youth groups for a post-Morsi transition plan, suggests a fundamental belief that the June 30 protests could realize Tamarod’s goal of replacing the president. Islamists who support Morsi’s government, primarily from the Muslim Brotherhood, responded with a counter-signature drive of their own called Tagarrod — or “Impartiality” — to reiterate their faith (no pun intended) in the political system and the elections that brought him to power. Supportive Islamist groups have also called for a June 21 protest against violence. However, the counter-campaign’s attempt to balance the scales only seems to accentuate the country’s deeply divided polity. Meanwhile, the army has responded ominously to the planned mass protests, issuing a public warning that it will “not allow an attack on the will of the people” and a calling instead for dialogue and (ha!) consensus. In a recent column for Egypt’s online Daily News, activist and one-time candidate for parliament Mahmoud Salem sketched three scenarios for how this latest confrontation ends: 1) a clear victory for the Muslim Brotherhood (MB), 2) a clear victory for the Tamarod campaign, or 3) a military coup. The forms the latter two outcomes would take are clearest: the government resigns and fresh elections are held, or the military tosses out the government and installs itself or a government of its choosing in power. It’s less clear to me what an “outright victory” for the MB would look like, but Salem seems to have in mind a violent routing of the organized opposition with the cooperation or at least complicity of the military. Salem sees the third scenario (military intervention) as the most likely one but acknowledges that the situation is highly uncertain. For reasons that are probably narcissistic but I’d like to think are intellectual, I’m struck by how closely Salem’s scenarios and outcomes match up with the game-theoretic model I use to analyze the politics of democratic consolidation and breakdown. This model portrays politics in newer democracies as a kind of “truel“—a lousy neologism for a three-way version of a duel—involving two rival political factions and the military. In principle, any of those three groups can usurp power at at any time. Election winners can rig the game to ensure that they keep winning; election losers can overthrow the government by revolutionary means; and the military can carry out a coup. In the metaphor of a truel, attempts to usurp or defend power are like shots fired at different rivals. As in a real gunfight, those shots don’t always hit or kill, and rivals can also choose not to fire. In many new democracies and other “transitional” cases, it’s easy to imagine one or two or even all three of these actors attempting to hoard or usurp power (i.e., take a shot) at almost any time, and it’s also easy to imagine most of those attempts failing. Democracy is effectively consolidated when all of those actors routinely abide by and uphold democratic procedures, especially but not limited to fair elections and freedoms of speech, association, and assembly. The risk of these usurpations of power never gets to zero, but in some long-standing democracies it’s awfully close to it. That’s the truel equivalent of everyone agreeing to put their guns away and resolve their disputes in other ways. In the real world, military coups have become less common than they were during the Cold War, and revolutions rarely succeed in overthrowing elected governments. Consolidations of incumbent advantage aren’t hard to find, though, and attempts at all three forms of usurpation are still common in the “life courses” of newer democracies. So what can the truel metaphor tell us about Egypt? First, it’s evident that Salem’s three scenarios exclude an important fourth scenario in which everyone either misses or holds his fire. If the June 30 protests don’t force out the Morsi government, inspire a military coup, or lure MB supporters into widespread counterrevolutionary violence, this latest round could come and go without producing dramatic changes in the political landscape. Based on the outcome of the last couple of confrontational moments in Egyptian politics and the fractiousness of the Tamarod coalition, I’d say this is probably the most likely outcome. The truel metaphor also raises some questions about the wisdom of the opposition’s decision to press revolutionary demands through mass unrest. This is the political equivalent of shooting at the incumbent, but game theorists will tell you that the optimal strategy for the weakest player in a truel is often to hold fire or to miss on purpose. That’s because the dominant strategy for the two strongest players is usually going to be to try to eliminate the other, so the weakest player can often do well by letting that confrontation play out, leaving him in a showdown with the lone survivor, possibly even with the advantage of getting to shoot first at a now-damaged rival. In Egypt right now, I’d say the MB and the military are clearly the two strongest players, while the groups behind the Tamarod campaign are still the weakest. If that’s right, then the maximalist strategy Salem and his cohort are pursuing is probably quixotic. As Salem acknowledges, this attempt to oust the MB is unlikely to succeed, but the act of trying is probably increasing the risks of both a military coup and a deeper consolidation of the Muslim Brotherhood’s grip on power by strengthening those groups’ fear of a revolution, and thus their incentives to preempt or respond to that threat with a crackdown or coup of their own. Of course, that might be exactly what some of the participants in the Tamarod campaign are hoping for. Some of the MB’s rivals have openly called for a military coup against the Morsi government as their best hope for a “reset” of Egypt’s transition, and the occurrence of sustained mass unrest is, at this point, probably the only thing capable of making that happen. By attempting another revolution—or a counter-counterrevolution, depending on whom you ask—these factions are probably looking to draw the Brotherhood’s supporters into a fight that would, in turn, lure the military into a coup. What looks a little crazy on the surface may turn out to be crazy like a fox. Last but not least, careful consideration of the current moment in Egyptian politics shows how the truel metaphor elides the possibility of bargaining among the players. After writing a draft of this post yesterday, I discussed it with Michael Hanna, a senior fellow at the Century Foundation. As Michael pointed out to me, there’s really a fifth scenario here, too, in which the military uses the credible threat of a coup to compel the MB government into a political deal designed to halt the spiral of polarization that keeps producing these showdowns. The military seems like it really doesn’t want to be responsible for governing Egypt right now, but it probably wants even less to see the country descend into a period of sustained mass violence. One way to try to achieve both of those goals would be to give the government an ultimatum: accept a compromise with the opposition or get shot at from two sides at once. If I had to lay odds, I’d say this is probably the second-most-likely outcome, after the “everyone misses or holds his fire” scenario described earlier. So that’s what my analytical self makes of this remarkable moment. All the while, my emotional self continues to marvel at the courage and tenacity of the many people who keep struggling to make the most of this historic opportunity to democratize Egypt, and to sympathize with the fatigue and frustration this seemingly endless transition and its accompanying economic woes must be producing. Honestly, I have no idea what that’s like, and it’s infinitely easier to comment from afar. Is Turkey still a democracy? Was it ever? How many jailed journalists and canisters of tear gas does it take to get to authoritarian rule? Turkish politics is not necessarily more open than it was a decade ago, when the [ruling Justice and Development Party, or AKP] was pursuing democratic reforms in order to meet the European Union’s requirements for membership negotiations. It is just closed in an entirely different way. Turkey has essentially become a one-party state… Successful democracies provide their citizens with ways in which to express their desires and frustrations beyond periodic elections, and Turkey has failed spectacularly in this regard. Cook and Koplow’s piece is titled “How democratic is Turkey? Not as democratic as Washington thinks it is.” What that title and the essay that follows implicitly acknowledge is that the questions I posed at the start of this post are sometimes impossible to resolve with confidence. I know this challenge well because as part of my work for the Political Instability Task Force, I used to have to make binary calls like that every year for all countries of the world with populations larger than half a million. To make those calls, I would apply a checklist I had developed to an assemblage of newspaper articles and reports from election observers and human-right groups and decide whether or not a country deserved to be called a democracy. My checklist was based on standard procedural definitions of democracy, and countries that failed to satisfy any one of the conditions established therein was labeled an autocracy. Either you’re in the club or you’re out. That process and the data it produced made sense for certain research tasks, but they also swept under the rug the ambiguity and uncertainty that makes cases like Turkey right now so important for our understanding of what democracy is, and how it really emerges and recedes. Many regimes are easy to tag as democracies or autocracies, but there’s a sizable bloc that defies this bifurcation, and this bloc has only gotten larger in the past 25 years. As more and more states that long eschewed democratic procedures have adopted them, they have often done so in bits and pieces. What one hand has given in formal rules, the other has often taken away with informal practices and outright subterfuge that are meant to preserve the power distribution “real” democracy would threaten to overturn. A regime is democratic to the degree that political relations between the state and its citizens feature broad, equal, protected and mutually binding consultation. Elections are the most obvious form that consultation takes, but they aren’t the only form, and states can hold free elections while screwing up the protection and mutually binding parts. So is Turkey a democracy? Who knows, but as Cook and Koplow argue, it’s almost certainly less democratic than it was a few years ago. As Erdogan and his supporters keep pointing out, Turkey under the AKP seems to be doing fine on the most obvious version of broad and equal consultation, namely, elections. Where it’s plainly slipped is on the “protected and mutually binding consultation” part. The disturbingly frequent arrests of journalists and alleged coup plotters, and now the state’s overreaction to nonviolent protests on matters of routine public policy, give the lie to the claim the Turkish state gives all citizens equal treatment and due process. Instead, we see a regime in which (paraphrasing Tilly) state agents increasingly use their power to punish their perceived enemies and reward their friends. What those remarks reveal is a state that is happy to appeal to the citizens who reliably support it but closes off consultation with, and even bullies, the ones who don’t. The resulting regime may still be recognizable as a variation on the theme of democracy, but the discordant notes of authoritarianism are plainly audible and keep growing louder. Bidzina Ivanishvili’s Georgian Dream coalition has only held power for a few weeks since its surprise win in last month’s parliamentary elections, but some of its first steps already have me worried about the risk of a reversion to authoritarian rule there. A week ago, Georgian authorities brought criminal charges against Bacho Akhalaia, a former defense minister and close ally of President Mikheil Saakashvili’s, along with two sitting officials in the Defense Ministry. This week, we hear that authorities have arrested five senior officials in the Interior Ministry on charges linked to the October election. I’m worried about these arrests because I’m watching them through the lens of a theory that sees strategic uncertainty as one the leading killers of new democracies. In my mental model, democracies can revert to authoritarian rule three ways: 1) an executive coup, whereby the ruling party quashes its rivals or otherwise rigs the political system in its own favor; 2) a military coup, whereby state security forces install themselves in government; or 3) a rebellion, whereby one or more opposition parties successfully seizes power by means other than a fair election. Rebellions occur rarely and almost never succeed, but executive and military coups are historically common, and most attempts at democracy worldwide have failed within a decade or two of their start by one or the other of these means (see here, here, and here for some previous posts on these broader points). The spoils of state power often play a strong role in enticing incumbent officials and military officers to attempt coups, but they aren’t the only force at work. Political factions may also be lured into undemocratic behavior by uncertainty about their rivals’ intentions and fear of the steep costs of guessing wrong. A game-theoretic model demonstrates this point in a formal way, but you can get the same idea by thinking about a Mexican standoff (and if you don’t know what that is, watch the embedded clip below from The Good, the Bad, and the Ugly for the classic cinematic example). In democracies, the three gunfighters are the ruling party, the opposition, and the military. In some cases, each of these factions may be itching to knock off its rivals as a way to win sole control of some treasure at hand. In other cases, though, some or all of the dueling pistoleros might genuinely prefer to cooperate with the others. Maybe there’s an even bigger treasure up the road that they can only capture if they work together, or maybe they’re just tired of shooting. Whatever the reason, the problem is that this desire for cooperation can’t always overcome the fundamental problem of mutual distrust. Because the stakes are so high, every little turn of the eyes or twitch of the finger is liable to get misinterpreted as a sign of bad intentions, and no one wants to be the sucker who waits a little too long to shoot in hopes that things will work out okay on their own. It’s not the handful of arrests themselves that are so worrisome, of course. It’s what they imply about Georgian Dream’s underlying intentions. In the Mexican standoff metaphor, these arrests are a menacing turn of the eyes and hips in the direction of Saakashvili’s United National Movement (UNM) and its sympathizers in the police and defense establishment. Maybe those fears are overblown. Maybe Georgian Dream is being straight with us when it says it’s just pursuing legitimate investigations into abuses of power during President Saakashvili’s tenure. Even if that’s the case, though, the resulting uncertainty about its true intentions and growing fear of a self-coup will increase the risk of a military coup or a rebellion by the UNM as these factions grow more concerned about their fading prospects under Georgian Dream. The stronger their belief that Ivanishvili has it in for them, the stronger their incentive to respond fast, before the bullets arrive and score some serious damage. My judgment might be clouded my affection for the place—I was a Soviet area-studies major as an undergrad; one of my oldest and closest friends is an American expat now living in Tbilisi, and I loved what I saw when I traveled there for his wedding a few years ago—but I’m optimistic that this budding standoff will wind down without any grave injuries or fatal mistakes. Georgia’s rival factions might not like each other, but they hate and fear Russia even more. 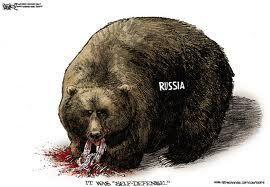 (The cartoon to the right sums up many Georgians’ views of their 2008 war pretty nicely.) Because of the omnipresent threat from its neighbor to the north, Georgia badly wants into Europe, and entry into NATO is seen as the first door through which it must pass. NATO has sound geostrategic reasons not to admit Georgia while the threat of renewed war with Russia lingers, but Saakashvili’s authoritarian tendencies didn’t help its case, either. The risk of further alienating Europe with a blatant demolition of democracy will probably be powerful deterrent to would-be rebels or coup plotters. European officials are keenly aware of this desire and already making good use of their leverage. A few days after the former defense minister’s arrest, RFERL reported that NATO Secretary-General Anders Fogh Rasmussen said he was “extremely concerned” about Georgia’s post-election politics. “It’s for the legal system, the judicial system in Georgia, to sort out these cases,” he told a meeting of NATO’s Parliamentary Assembly in Prague, “but of course it’s important that such trials are not undermined by political interference and we will of course follow that development very, very closely.” As will we.